West Roxbury, Mass.— Charlie Nascimben quit USA Swimming two years ago. Only an eighth grader, he blamed fatigue. He resented competing and despised the six-day-a-week, year-round practice schedule even more. So, he bid adieu to the club circuit and focused on the three-month high school swim season instead. 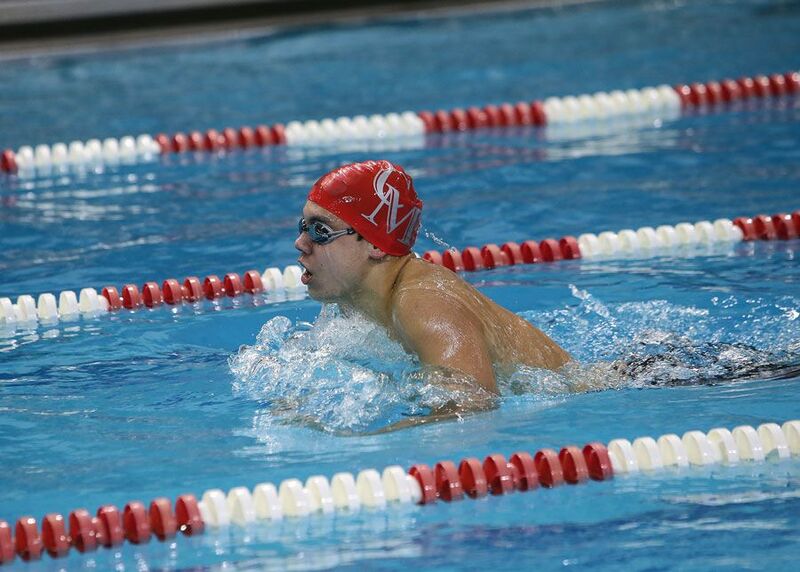 Now a junior at Catholic Memorial School, Charlie is preparing to compete in the 100-meter freestyle and breaststroke competitions at the South Sectional Championships this weekend at MIT. He enters the pool as the one-seed in both events. So, what changed from his time in the eighth grade to now? When asked this, he recalls a single conversation with CM varsity swimming head coach Mr. Patrick Murray at last year’s state meet. Charlie, only a sophomore then, placed seventh among a field of over 40 swimmers at the state meet hosted by Boston University. But, he left the pool disappointed. Mr. Murray noticed and reached out. “I was surprised that I went under 50 seconds for the first time,” said Charlie. Charlie took Mr. Murray’s words to heart. His first taste of success on the state level reminded him of how good he could be. And he wanted more. Mr. Murray left Charlie with a final token of motivation before his sophomore season ended. He named Charlie a varsity captain on behalf of a team vote, challenging him to set an example in and out of the pool. “The team named him captain because they saw him working harder than anyone else in the pool,” said Mr. Murray. “They see how much he cares about making the team better. He’s built genuine relationships with everyone on the team from the seventh graders to his current classmates." To set this example, Charlie knew that he needed to embrace his gifts as a swimmer instead of not training at all after the high school season. This meant rejoining the USA Swimming club circuit to better prepare himself for the next high school season. He wanted to improve his times for the sake of his CM teammates and coache, not just himself. That next week, Charlie picked up the phone and called his old USA Swimming coach, Mr. Jon Castaldo. Mr. Castaldo, Charlie’s first USA Swimming coach, coached an eight-year-old Charlie on the Metro West Athletics Club team. Charlie knew of a few open spots on Mr. Castaldo’s new Charles River Aquatics team. His coach, in turn, knew about his year-and-a-half hiatus away from the USA Swimming circuit, which meant that Charlie needed to plea his own case. “Making that phone call, I was really nervous,” said, Charlie. During that phone call, his old coach reminded him of the year-long commitment required from every athlete on a USA Swimming club team. Daily double practices in the summer, evening workouts, and the occasional 5 AM swim gave Charlie enough apprehension to reconsider his intentions. But, he remembered Mr. Murray’s parting gift. “When Coach Murray announced that I was going to be captain at the end of last year, I knew that I needed to step up,” said Charlie. Following a tryout, Charlie earned his way on to Mr. Castaldo’s team. He worked out day and night, adjusted his diet, and even utilized CM’s new Health & Wellness center during the fall. From the time he left the pool last winter to the start of the 2019 season, Charlie lost 20 pounds. Seconds off his freestyle times followed. Last week, Charlie saw his dedication and commitment culminate at the Catholic Conference Championship meet. He won Meet MVP with his first-place finishes in the 100 Freestyle and 100 Breaststroke races. No other CM Swimmer has ever won two conference titles in the same season nor finished the 100 Freestyle race with a faster time (49.06 seconds). Heading into the South Sectional Championship race this weekend, Charlie holds his head high. He wants to wrap up unfinished business from last year without overlooking the next race. “I’ve put Charlie in as many situations as possible to really test him,” said Mr Murray.